When the date for the 2013 Jazz Half Marathon and 5K was announced nearly a year ago, I was excited about the earlier date that wouldn't conflict with other Halloween happenings in the Crescent City. I expressed some concern to my friends about the weather, but was convinced that we would have an early onset fall that would keep us cool for the race. Apparently that wishful thinking isn't coming true. 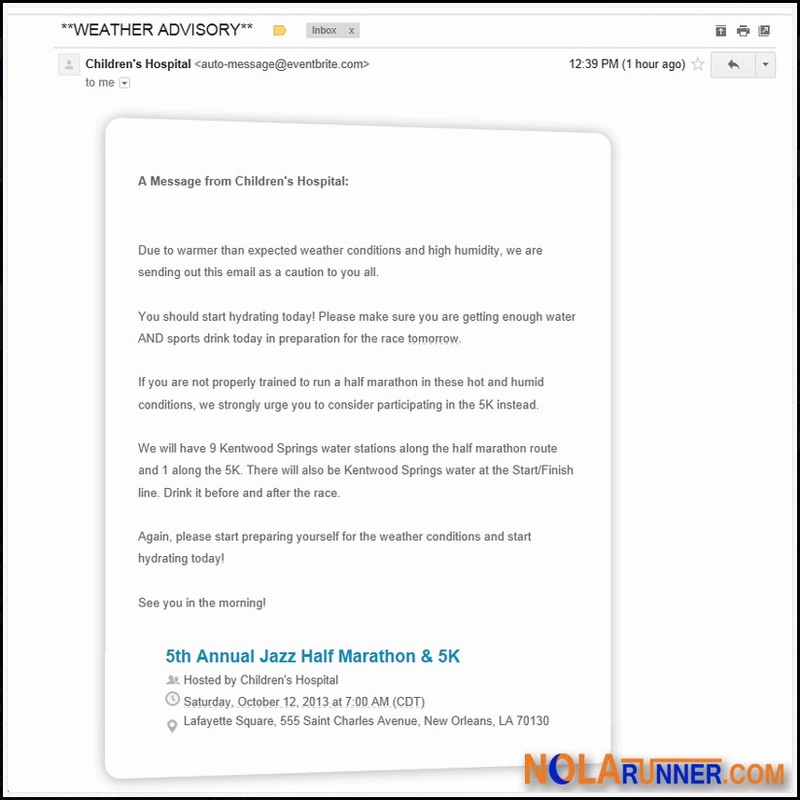 The Jazz Half race organizers just sent out an advisory (see photo below) to participants warning them of anticipated warm and humid conditions in the morning. They're giving the very astute advice to start hydrating TODAY in preparation for the race. That suggestion isn't something runners should be taking lightly. Here are a few additional tips to get you through the sweat fest that will be the Jazz Half. Get ahead of the Curve. Start hydrating the day before your race (TODAY). Your body will retain the fluids you need, as well as other minerals that you'll require during the run. A good way to gauge how well you're hydrated is by looking at simple signs from your body. Urine color may not be something we want to talk about this close to lunch, but a clearer output means your body has adequate fluids. Don't consume water alone pre-race or on race day. Sweat isn't just water, its electrolytes and other elements that your body requires to function. Supplement your water intake by consuming sports drinks alongside the H20, keeping those levels up. You probably used sports drinks during your training, so continue to use that pre-race. On race day, there will be both water and sports drink provided on course. Take advantage of these frequently. Speaking of on course fluids, devise a place that suits your needs for intake. In my case, I hydrate at least a little for every water station I encounter. I'll consume water only for the first 4-6 miles, and then alternate between water and sports drink through the end of the race. Figure out what's working for you based on how you feel, and stick to it. Cramps may mean you're dehydrated. If you stop sweating, that doesn't mean you're cooling off, it means you're dehydrated. Listen to the signs your body gives you and react accordingly. Lastly, you'll need to replenish fluids as soon as you finish the race. Just because you stop running, it doesn't mean your body stops working hard. It continues to catch up to the taxation you just put it through. Slowly it will transition in to recovery mode, which still requires proper feuling. Drink water and sports fluids when you're done running. That post race beer may taste good, but it also replenishes carbs and electrolytes. In moderation, it isn't a bad idea. Please keep in mind, I'm not a physician. These tactics are what works for me, and they are backed up by numerous articles online (including this great one from Runner's World Magazine). If you haven't trained properly in the heat and humidity, transitioning to the 5K isn't the worst decision. Have fun, but make your health a top priority. Have a great race! Why did they have to move this race to mid-October? First of all, it means I have to miss out, but the weather is almost ALWAYS hot this time of year. I told you so, Jazz Half. I told you so.